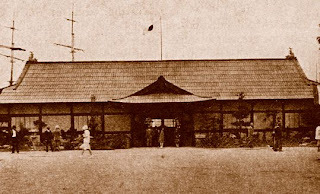 Located on the south side of the Avenue of Nations, west of the Guatemala Building, the Japanese Building was constructed in the style of Japan's Nara period, and surrounded by a small Japanese garden. Reinan Tsukanoto was the architect of the building, and Chiura Obata the artist responsible for the structure's beautiful interior decoration. The Japanese Building was so popular among visitors that it was called "the best of all the foreign structures" at the Pacific Southwest Exposition. The many exhibits contained within the building consisted of displays brought from the San Francisco Japanese Commercial Museum, and merchandise contributed by numerous Japanese merchants of Los Angeles and San Francisco.